Over time, plastic light enclosures can become discolored, foggy, scratched, yellowed and seemingly destroyed by the harmful effects of daily driving and your cars age. Did you know that all these factors can reduce your night vision driving by as much as 90% ? The solution - Guaranteed Headlight Restoration! The finished results are amazing - See for yourself! Don’t risk your safety and the safety of other drivers by driving with your high beams on all the time to see just a few feet ahead of your vehicle - have your lenses restored for the safety of you and your family. Our process will renew your car or trucks headlights back to their original appearance without the hefty expense of new purchasing new replacement lenses. Depending on the age and model of your vehicle, getting new headlights installed could cost from $500 to over $1000 once the dealers labor charges are added into the price. 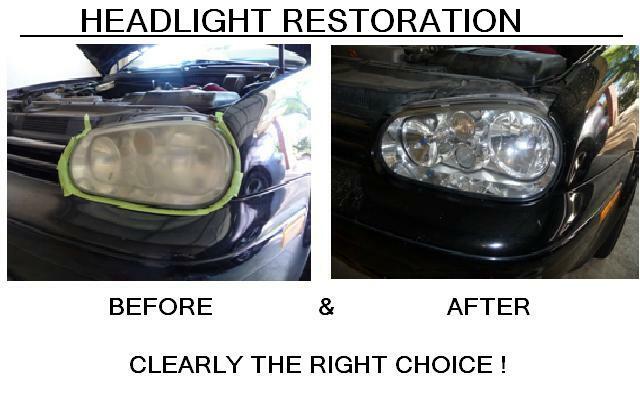 Headlight Restorations offers is a viable, inexpensive solution. Starting at only $89, isn’t your family's safety worth it? Many customers are blown away with the finish results and in many cases believe that we've replaced them with brand new headlights. Copyright 2010 SONIC AUTO GLASS. All rights reserved.